The Saas Fee Summer Institute of Art was founded by fine artist and theorist Warren Neidich and is co-directed by art critic and poet Barry Schwabsky. It was conceived in 2014 as part of an ongoing effort to engage contemporary artists in political, socio-economic, philosophical and historical discourses concerning the power of art. Importantly it realizes that art plays both a generative and emancipatory role in producing theory while at the same time being aware of Neoliberal capitalism’s recuperative prowess. The SFSIA is a traveling, nomadic academy that originated in Saas Fee, Switzerland in 2015. It moves to Berlin in 2016. Satellite events will follow in Pereira, Columbia, at the Salon Nacional de Artistas in 2016 and Los Angeles in 2017. 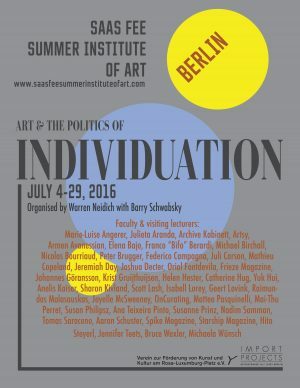 The Saas-Fee Summer Institute of Art-Berlin evening Public Program is free and open to the public. All lectures begin at 6 pm at our venue. Recently Cognitive Capitalism has evolved from its roots in Italian Operaismo as a strictly social-political-economic field of study to one that now engages with the brain’s neural plasticity to develop an extended materialism concerned with the world, the body and brain simultaneously. Building on the framework established by last year’s inaugural Summer Institutes, which focused upon the emancipatory power of artistic estrangement, in 2016 we will attend in particular to the voices of Gabriel Tarde, especially his ideas of difference, repetition and imitation, and of Gilbert Simondon, for instance his considerations on individuation and the processes of concretization of the milieu. This will allow us to engage with the issues of the power of metadata and the internet to mimic, disseminate and customize information as well as their ability to stabilize and intensify its flow. In the art context this has manifested itself in the abundance of performative and virtuosic artistic practices, the recent turn in conceptual art from its initial focus upon immaterial objects to that of immaterial labor, the upsurge of networked practices and the rise of queer and feminist approaches all offer a means with which to intervene and critique institutionally driven patterns of normalization in the cultural milieu, body and brain. Once again, the Saas Fee Summer Institute will engage topics such as speculative poetics, cognitive capitalism and accelerationism, but with an eye toward such topics as affective politics, digital automation and predictive algorithms as they restrict free choice as well as an exploration of notions of the gendered brain and xenofeminsim. Lectures, discussions and workshops with outstanding artists and thinkers will open multiple perspectives which should also be reflected in the exhibition at the Kunstverein Rosa-Luxemburg Platz that participants will produce in the last days of the course. The exhibition space will serve as a studio where participants can apply ideas learned during the course. For art students, practicing artists, art historians, art critics, critical theorists, curators and architects who are seeking a deeper theoretical understanding of their practice. This course will act as a springboard to new thoughts and ideas. All courses are taught in English. This is an intensive and immersive program that runs Monday through Saturday.